Stop : This robot has been tested by brainyforex and it does not work in the long term. It cannot handle long term trending markets that don't retrace. It's a losing system. Read brainyforex review and take a look at the trading statement after 219 days. Go here. Forex Crescendo EA Automated Forex Robot claims to make 60 pips daily profit on average, based on mathematical strategy, has consistent results, low risk, suited to a volatile market, only one unprofitable day in seven months, live results by mt4stats.com, said to be verified by Mark McRae of surefire-trading.com. With an introduction like that it's now wonder veteran traders are saying that Forex Crescendo is probably the best EA released commercially. Andrea Salvatore, the man behind this automated trading system is a programmer and developer of this unique EA. He has an avid fan base and after years of honing his skills as a Trader, he has combined his skills, knowledge and experience in the fields of Trading and programming to produce a remarkable, never-before -seen or used EA. Its exact programming remains secret. Andrea says it’s the culmination of years of hard work and perseverance and the results speaks for themselves. Forex Crescendo trades multiple currencies at the same time. Namely GBP/USD and GBP/JPY. What sets it apart from the other EA's on the market is that it enters and exit's trades based on a mathematical formula. That's correct, not based on an indicator strategy. The user is encouraged to leave the robots settings on default, but there is the option to change it's trade frequency and level of risk. The system can be traded on fully automatic mode or semi automatic. Traders want to know what time frame chart does it trade and it's stop loss level. The EA can sit on ANY TIME FRAME. It uses an unconventional approach to stop loss levels by taking a portfolio approach to limiting risk. That means that all open orders are netted against each other combining the multiple currencies and thereby allowing risk to be kept under control while profit targets are activated without a set stop loss as per your normal trading system. In other words, set stop losses are not used but strict risk loss levels are applied within the trading formula. Keep reading below to find out more on this. Based on the 'frequency' setting at specific times of the day the EA checks if conditions to open an order are met. It does that for both currency pairs used for trading. If there are no previous open orders, it opens one in the direction suggested by the trend algorithm. If there are already other open orders, and the distance from the last open order is greater than the number of pips set in the 'order-step' setting, it opens a new order in the same direction with the same lot size. As soon as the profit of all the open orders for each pair is equal to or greater than the 'target_profit', it closes all the open orders for that pair. On average, around 2 trades a day are opened and closed. But you can usually expect between 0 up to 4 trades a day with the default 'frequency' setting (4 = every 12 hours). If the total $ value of all the open orders (both the currency pairs) is in loss of more than the 'max_total_DD' percentage value, all the orders are closed. [This is the stop loss policy]. This is a "safety net" in case of a huge sudden change in trend. Profit check and draw down check are made in real time. The 'frequency' setting determines only how often the EA will check the market for conditions to open new trades. 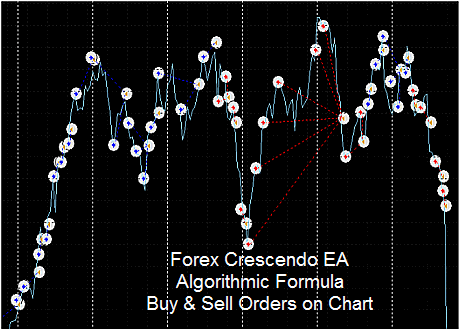 Every time the Forex Crescendo is about to make a trade, it runs my algorithmic formula. That secret formula measures everything it needs to know in order to make a trade. If it doesn’t get the answer it likes, it doesn’t do anything. This lets the market tell it when it’s time to trade. You see the difference? Most programmers come up with an idea, then make a trading robot to trade the market. They are basically saying we are telling the market how it is going to behave. With the Forex Crescendo, I let the market tell me what to do. I don’t try and tell the market what to do. If the market tells the Forex Crescendo it’s not safe to trade, it doesn’t trade". Look at live results here. Brainyforex has tested this EA with poor long term results. Results (via demo account) through mt4i.com shown here. Public Independent Forex Crescendo Reviews.